I wanted to go to Dallas to watch the Mavericks at home during this NBA Finals series, but the Tuesday, Thursday, Sunday schedule is terrible. Honestly. Someone in the NBA needs to re-examine the schedule and fix it, so that fans can travel to watch their teams without missing a couple of days of work by leaving in the middle of a week. PLEASE. Since I couldn't travel to the game, I ended up listening to most of the 4th Q of Game 5 on the radio. I think I was listening to the Miami Heat broadcast. Initially I thought about changing to listen to the Mavericks radio personnel, but thought it'd be more entertaining to hear the Heat broadcasters spin the events of the game. While driving, I was grinning from ear to ear. It was Game 5, and my rental car had XM radio. I couldn't believe what I was listening to! I was loving everything that I heard. 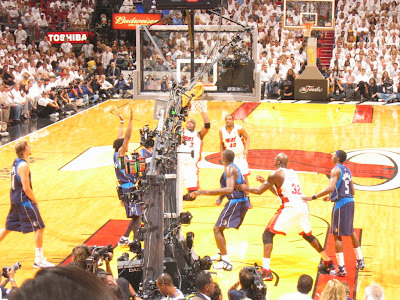 The Mavericks were winning and playing so well. Jason Terry was clutch. Jason Kidd was making plays. Dirk was killing it. The whole night seemed surreal beginning with a crazy, rain storm and ending with a Mavericks' surge. It was BEAUTIFUL. My friend, Mandy, sent me this picture from Game 5. Does anyone know where these Dirk Wirk stickers are coming from? If so, please contact me. Does anyone know where these Dirk Wirk stickers are coming from? If you know me or read this blog, you know how I feel about LeBron. Paying attention to this series has actually changed my opinion of Chris Bosh. I wasn't a fan of his earlier this season, because I felt like all the attention had gone to his head. Well, to be fair, he has raised the level of his game and deserves the praise he's receiving. Dwyane Wade is a champion. I like him. The "problem" for me and the Heat (i.e. specifically in the 4th Q) is LeBron. I listened to Jason Smith (Twitter: @howaboutafresca) on ESPN Radio for the first time last night and he dissected the post-game press conference comments from Coach Erik Spoelstra. When asked about whether getting LeBron going in the 4th was a priority for the Heat (i.e. and yes, I'm paraphrasing), Spoelstra responded "We'll see..."
I don't know about you, but when I'm trying to let someone down or turn someone down, I always say "We'll see." It's not a "NO", and to quote the movie "Dumb and Dumber" ~ "So you're saying there's a chance?". 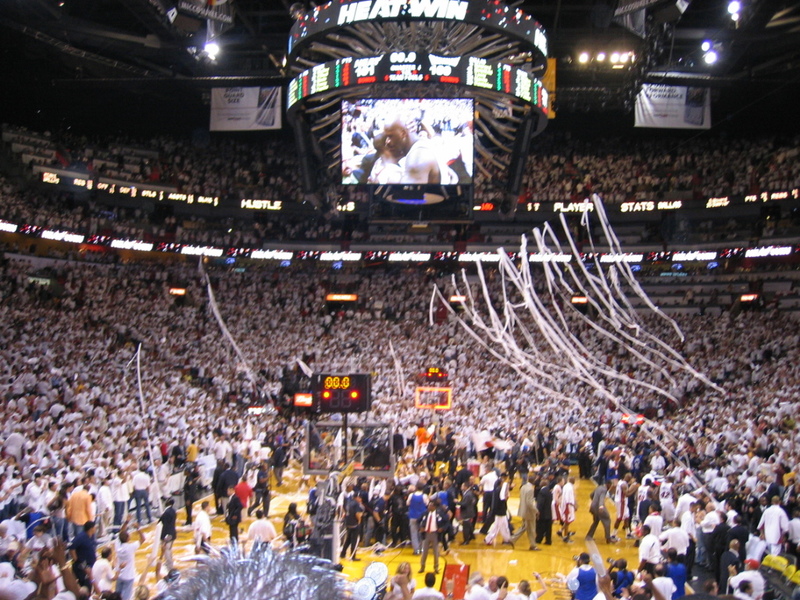 The Miami Heat fans who jumped on the bandwagon because of LeBron should reconsider how quickly they pushed aside Wade and gave LeBron the thrown. Wade should be the closer for the Heat. Wade is the leader of the Heat. Look at the dynamic on the court. LeBron defers to Wade. Wade IS the leader. Cavs fans are used to LeBron's brand of play. Excuse us if we've already heard the "LeBron only has 75 cents for a dollar joke". We Cavs fans, have already "been there and heard that." We've heard it all before... **** Great. Now I have the Sunshine Anderson's tune in my head. I received an email from GV Art and Design and they sent me a link to their "Let's go Cleveland Mavs T-shirt." Here's a link to the product: http://gvartwork.myshopify.com/products/lets-go-cleveland-mavs-t-shirt. Unfortunately the shirt is sold out, otherwise I'd buy one right now! Guess who's locked and loaded for Game 6. Miami here I come.... **** I will confess that, I went to Game 5 last year in Miami, and the Heat won it. Here are three pictures I took at the game. i would like to know who made this awesome head picture thing? where can i get it in high quality. ?